Published on June 16, 2013 in Bands/Artists, Daytrotter, Eastern Iowa, Music, Out and About, Upcoming Show and Vinyl. 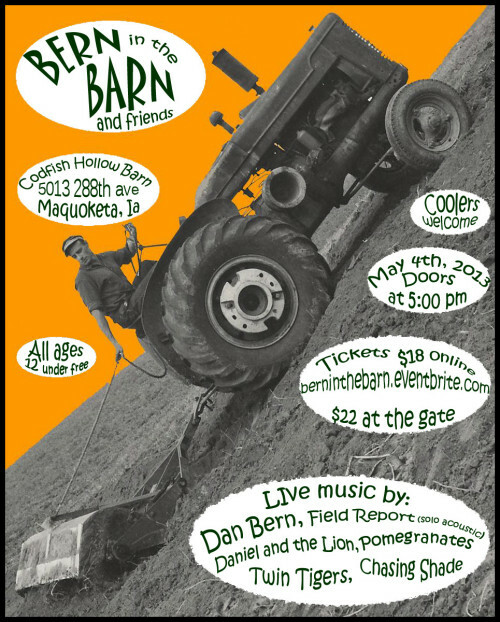 0 Comments Tags: 7" poster, Andru Bemis, Barnstormers, Becky Stark, Codfish Hollow Barn, Dan Bern, Daytrotter.com, IA, John C. Reilly, John Reilly and Friends, Lavender Diamond, Live, Maquoketa, Old Crow Medicine Show, sticker, teeshirt, Third Man Records, Tom Brosseau, Upcoming Show, Vinyl, Willie Watson. 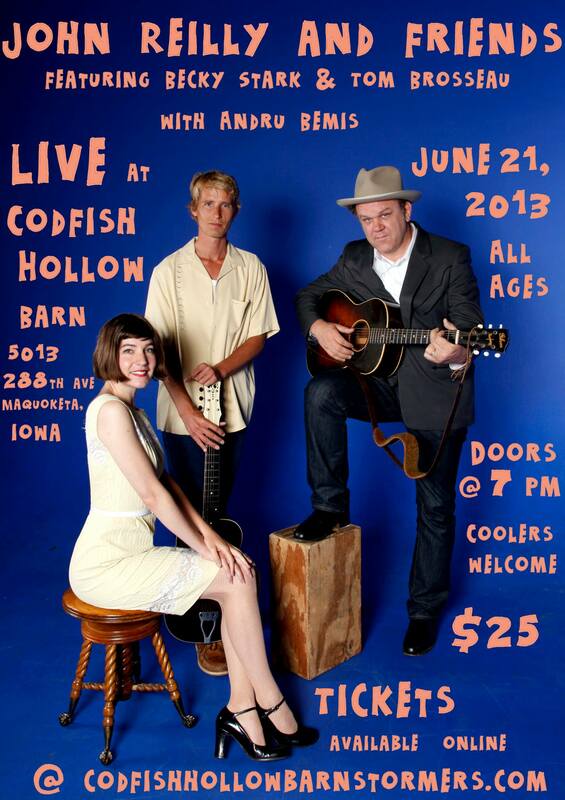 Continuing the trend of jaw-droppingly awesome shows at Codfish Hollow Barn in Maquoketa, this Friday, June 21st, it will play host to actor John C. Reilly’s non-film music endeavor John Reilly and Friends. For the past few years Reilly has been working with some musician friends of his to bring a revue of old country and folk music of the likes of the Stanley Brothers, Porter Wagoner and Dolly Parton, The Everly Brothers, Claude Ely and the Delmore Brothers to name a few. With regular “Friends” sidekicks Becky Stark of Lavender Diamond and Tom Brosseau (solo and of Les Shelleys) Reilly cut two 7-inch singles on Jack White’s Third Man Records. 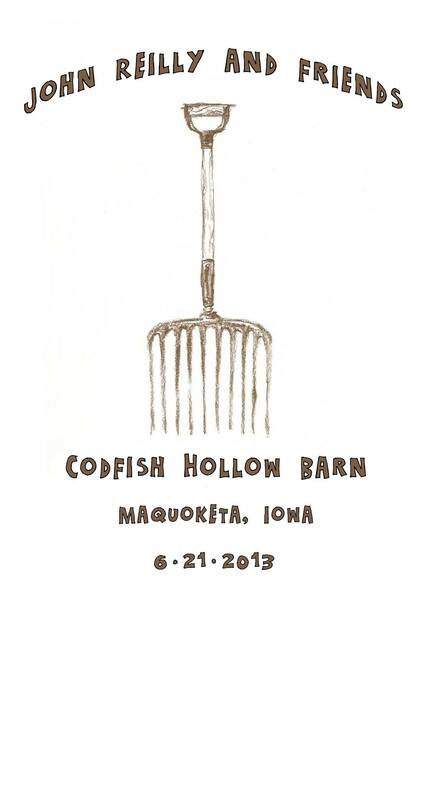 The band is doing a run of dates through the Midwest from June 13th to June 22nd, with a stop at the wonderful Codfish Hollow Barn in Maquoketa, IA– home of many Daytrotter.com Barnstormer shows as well as a few shows put on by the Biehls themselves. Joining Reilly, Stark and Brosseau will be Mt. Vernon, IA native Dan Bern (who headlined his own show in May), Willie Watson— formerly of Old Crow Medicine Show (OCMS’s “Wagon Wheel” has been covered by Darius Rucker and climbing the charts currently), and Sebastian Steinburg– formerly of Soul Coughing and these days a go-to bass sideman (Marc Ribot, Dixie Chicks, k. d. lang). That’ s one hell of a lineup with lots of varing backgrounds, so you can count on some pretty inspired performances! 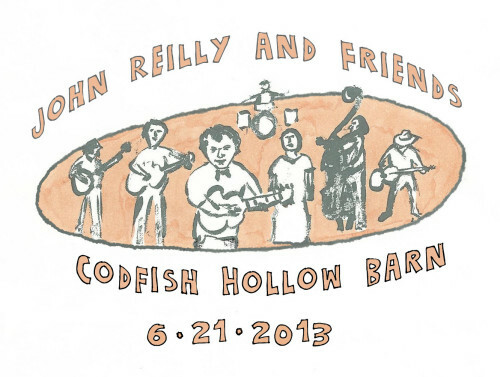 John Reilly and Friends Limited Edition Codfish Hollow Poster available at the show. Opening the show will be Andru Bemis from New Mexico. At the time of this writing there are still tickets left, but you should expect that this show will sell out this week. Doors are at 6:30PM with the bands hitting the stage at 8PM. The tickets are $25 in advance (plus some minimal service charges). 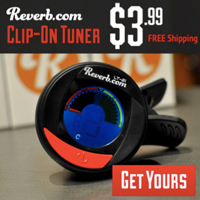 Click Here for the Facebook Event and RSVP! 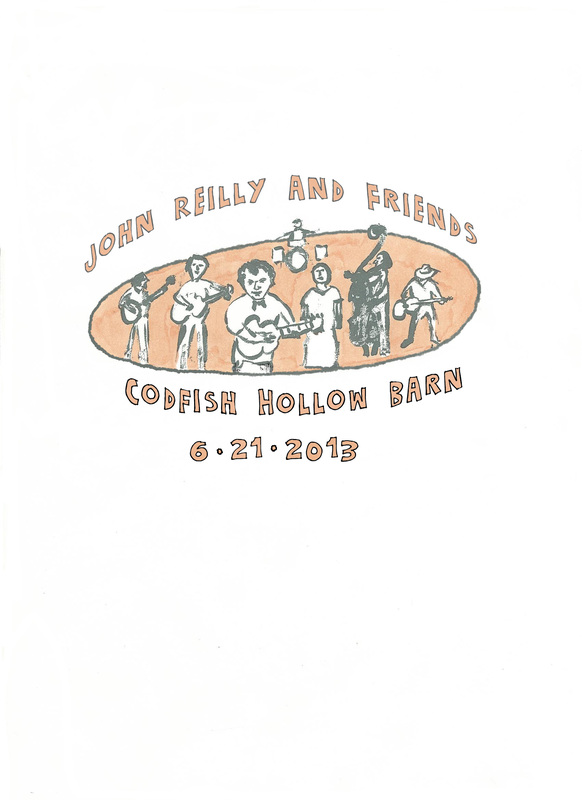 Click http://johnreillyandfriends.eventbrite.com/ to order your tickets! I was interviewed in The Cedar Rapids Gazette Arts and Entertainment magazine Hoopla– click here! Click Here to visit the Third Man Records page on John C. Reilly and purchase his two singles. The Time to play b-sides archives for the dan-bern tag.